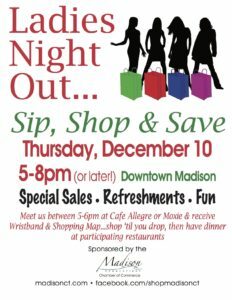 It’s time shop local this Thursday from 5 – 8pm in downtown Madison. Checkin at Moxie or Cafe Allegre for a glass of wine and to get your map and your wristband and let the shopping begin. The wristband enters you into a drawing and gets you discounts at participating shops and restaurants all night long. Stroll downtown Madison and enjoy the spirit of the holidays with friends and family. Spend the night and save even more. The Scranton Seahorse Inn will deduct $10 for every $100 you spend We’ll tally your receipts Friday morning before checking out after breakfast. Maximum discount $50. Does not include restaurants. Call today and reserve your favorite room and get ready for some fun.